Medieval Clothing: Kings, Noblemen and Peasants. During the Middle Ages clothing was dictated by the Feudal System and highly influenced by the Kings and Queens of the era. Medieval clothes provided information about the class status of a person. Due to Sumptuary Laws, only the wealthy could dress in fashionable clothing. 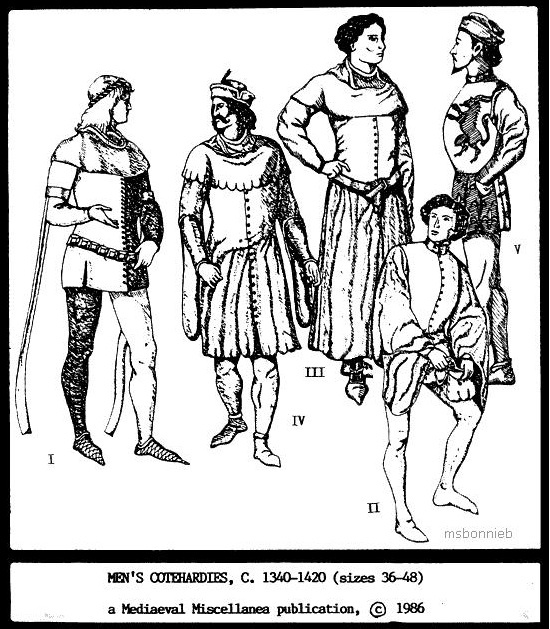 A dress pattern from Bonnie's Pattern Shop shows men's clothing between the 1300-1400s. • Hats made of different kinds of felt; wool or cotton; or otter or goatskin. • Points were attached to garments. • Some sleeves reached to the ground. • Men’s girdles were studded with gilded ornaments and precious stones. • Furs were worn profusely in a display of extravagance. Peasant men, like their female counterparts, wore clothing that was more practical. Even men in lowest ranks of society, however, wore clothing that was short and tight consisting of tight drawers made of leather, a tight tunic and a cape of cloak made of brown wool. Peasant tunics were worn with a belt that held a knife, purse and sometimes work tools. Medieval serfs wore a cloth blouse and leather belt, a wool overcoat, short wool trousers and large boots. While noblemen wore hats of various shapes, serfs generally went without a hat. Sometimes in poor weather a serf might wear a wool hat or cap. During the 12th century even headdress began to mark a person’s social position.